Hello from Kelly, in association with Dr. 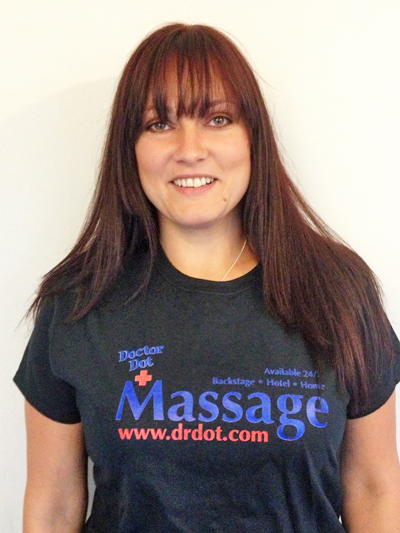 Dot, which combines my love of music with my skills as a remedial massage therapist. Fully insured, degree qualified in sport therapy, with additional qualifications in anatomy & physiology, pregnancy massage, seated massage, Indian head massage and Swedish massage, my speciality is deep tissue work to ensure optimum benefit from my treatments. A good massage will aid in the healing process, enhance function in muscles, joints and ligaments, improve circulation and promote relaxation and well-being and I can deliver the best possible outcome from your treatment. Where it hurts often isn’t why it hurts and in 8 years of working as a freelance therapist, I’ve developed a wide interest in how the body works and how to optimize its performance using hands-on therapies. I use a wide variety of highly effective techniques to achieve the best result for my clients, whether for injury, strain or tired muscles – or simply a feel-good boost to relax and revive you during demanding and challenging times. My work has taken me all over the UK and Europe – including a full season in a French ski resort, working with a diversity of professionals from rugby players and skiers to musicians, dancers and festival goers. As a footloose freelance, I am happy to tour, flexible and willing to travel at short notice to any location in the UK or further afield.